Lately I've been seeing a lot of articles regarding the rights of photographers, both professional and amateur. Among the general population there is a lot of confusion about where one is allowed to take photos, of whom you are allowed to take photos, and what one's expectation of privacy is. This issue most frequently gets raised when a photographer comes into conflict with a police officer. I'm writing this because last night I had such an incident. It started while I was brushing my teeth. While polishing my pearly whites I vaguely heard three loud bangs. Melissa, who was reading in the living room, shouted out to me that she had heard gunshots. Skeptical, I shoved my face against the window to see if I could hear any commotion in the back lane. The coast was clear, but Melissa was certain about what she'd heard. 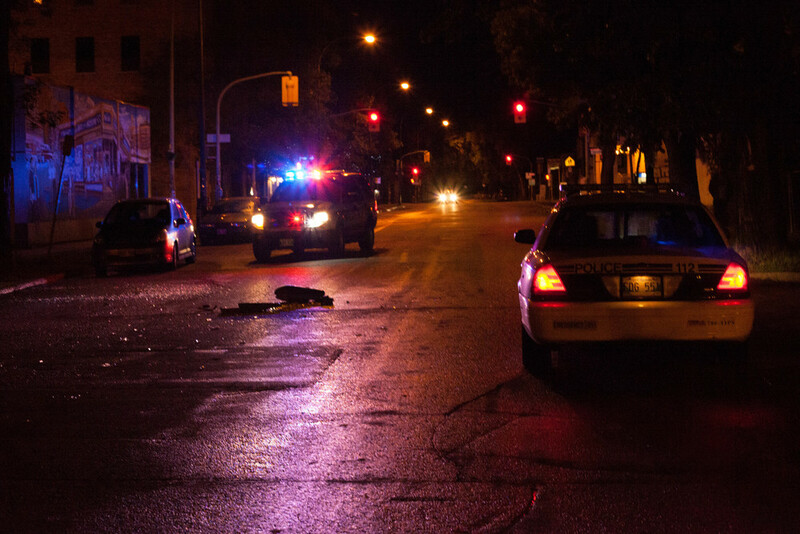 We turned on the online police scanner, and sure enough others were reporting a shooting just around the corner on Wolseley Avenue. I grabbed my camera and we headed downstairs and to the scene. When we arrived the cops were already there. Broken glass littered the street, and witnesses were huddled around, smoking and typing away on their phones. I started to snap photos, being diligent not to interfere with the scene or obstruct the police in any way. I circled around, getting photos from various angles and talking to neighbours who had come out to see what all the commotion was about. Several officers asked if I had seen anything. I explained that I had not, that I only heard the shots and didn't arrive on the scene until after the cops had come. They shot me suspicious looks as I continued to point my camera in their direction, but at no point did any of the dozen or so officers that came and left the scene demand that I stop. While Melissa was being questioned a second cop approached me to, in his words, "offer some advice." He suggested I not take photos of crime scenes. He said that it looked like I had an expensive camera, and that it would be a shame to have it confiscated as evidence. I contested this point, stating that I know my rights and that they could not take my camera, regardless of whether they thought it contained photographic evidence, unless they showed me a warrant first. The officer claimed that this was false, and that they could take it and I wouldn't be able to get it back until the investigation was completed and it had been cleared. I was trying my best to keep my cool but stand my ground. I was pretty certain that what he was telling me was wrong. It seemed too much like an attempt to politely intimidate me. He clarified that he didn't think he'd have to confiscate my camera, but that could be a real possibility in the future. Unperturbed, I took a few more shots before heading home, still in possession of all my gear. At no point did I actually feel threatened, but the incident raised an intriguing question. Is a warrant necessary to confiscate camera gear if the police suspect it may have captured a crime or contain other photographic evidence? As I mentioned, I'm pretty sure a warrant is required, but rather than relying on blog posts for legal advice I'd prefer to hear from a legal professional or a photojournalist with experience.